Barney’s Version accomplishes a feat that most Canadian literature can’t: it transcends its genre and stands on its own as an enjoyable read. It’s a rare trick for a Canadian author, but Mordecai Richler is one of the greats. Barney’s Version is an enthralling and entertaining book that sheds so many of the conventions that other Canadian authors seem to love. Don’t get me wrong. I enjoy CanLit. As a Canadian Studies major in my undergraduate years at the University of Toronto I’ve read my fair share of Canadian fiction. Probably your fair share too. But what should simply be a geographic category has built up an almost immobilizing amount of clichés that detracts from what should be a vibrant literary scene. Seriously, most CanLit should come with a check list. Small, rural town with a main street of boarded up store fronts. A dark family secret, preferably involving sexual deviancy. Backhanded compliments towards the British and Americans that have a hint of jealousy. Rueful musings about life and history throughout the story. Sometimes these characteristics are handled with aplomb, like Robertson Davies’ Fifth Business, but more often than not they create a kind of narrative rust that slows the plots of a lot of Canadian fiction. 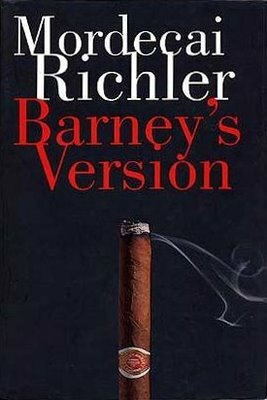 However, Richler’s Bildungsroman/murder mystery/pseudo memoir as told by Barney Panofsky – and annotated by his son Michael – eschews most of these conventions. It even mocks them in the form of Terry McIvor, the elder Panofsky’s nemesis. This self-awareness makes this the best book of Richler’s career. Barney’s Version is set in 1995, as Quebec is preparing for its referendum on sovereignty. Barney, the main narrator, is coming to grips with the disappearance of the Montreal he knew and loved as well as his own personal decline as his body and memory begin to fail him. The memoir is both a reaction to the unravelling of the world around him as well as a response to the sharp criticisms in McIvor’s autobiography and a final attempt at clearing his name in the disappearance – and probable murder – of his best friend, Boogie Moscovitch. Planted firmly in the Richlerverse, with characters from earlier novels like the Apprenticeship of Duddy Kravitz, Saint Urbain’s Horseman and Solomon Gursky Was Here appearing throughout, Barney’s Version is Richler’s masterpiece of narrative storytelling and character development. What’s most impressive is that the book is incredibly clever without ever getting showy or cute. Richler’s sharp use of an unreliable narrator – arguably two depending on how much faith you want to place in Michael Panofsky’s footnotes – is sharp and really stretches out the murder mystery until the very last page of the book. Barney’s Version is well worth checking out, whether you’re familiar with CanLit or not. It is Mordecai Richler at the top of his game, pushing the narrative envelope while breaking new ground for a Canadian author, making him a singular literary figure in Canadian culture.